The VJM02 marks a complete change in design philosophy, not only due to the major regulation changes. Thanks to a new partnership with Mercedes as agreed in November 2008, Force India says goodbye to Ferrari as an engine supplier and instead will have the complete drivetrain delivered by McLaren and Mercedes - including engines, gearboxes, hydraulics and KERS. The team has also changed internally. After Mike Gascoyne left the team for being too imposing, design director Mark Smith has taken up more responsibility. 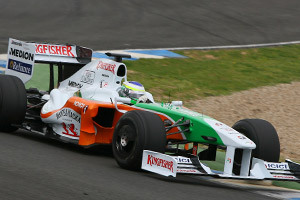 Mark re-joined Force India in November 2007 to lead design and production of the VJM02. Mark has taken responsibility for the day to day running of the Design Office and Research and Development. He was assisted by technical director James Key and a small team spear-headed by 2009 project leader Ian Hall. The new team immediately faced a stiff challenge to get the car ready in time. Most of the development was condensed into 5 months, resulting in not taking part of most winter tests due to still being in the development phase. Mark Smith explained on 1 March at the launch: "When we confirmed the partnership on 10 November 2008 we had to adapt our plans fairly significantly. It's not just a case of getting the new parts and installing them; when we changed the gearbox, it had slightly different suspension mountings and when we changed the rear suspension there was a necessary change on the front." "Normally you would have started in August, so we have had to compress everything into five months. Everyone has really worked hard to make it work and we've got a potentially better package, so the change has been a positive rather than a negative." The eventual car, despite its short development cycle, displayed several interesting bits during the first tests. The sidepods were shaped as tightly as possible, while most other teams tried to make the surface as smooth as they could. Just as with McLaren, the exhausts are located fairly backwards and point straight to the rear wing end plates. Having them located a bit higher above the sidepod surface immediately resolved the heat problems that several other teams had trouble coping with. The front of the car draws immediate attention because of its high nose, in fact it's the highest of the 2009 field, yet it follows a trend to move away from the low noses that were developed in the years before. Also because of the higher nose cone, the front suspension has been redesigned with the steering arm not aligning the upper wishbone. The team is not the only one to have taken that route as it allows for the suspension and steering components to be located a bit lower inside the nose. All in all, the new car was introduced with high aims. Team principal Vijay Mallya declared at the first test that there would have to be regular points finishes. Front suspension: Aluminium MMC uprights with carbon fibre composite wishbones, trackrod and pushrod. Inboard chassis mounted torsion springs, dampers and anti-roll bar assembly. Rear suspension: Aluminium MMC uprights with carbon fibre composite wishbones, trackrod and pushrod. Inboard gearbox mounted torsion springs, dampers and anti-roll bar assembly.